The Flash is a name shared by several superheroes from DC Comics. Created by writer Gardner Fox and artist Harry Lampert, the original Flash first appeared in Flash Comics (1940 series). Nicknamed the Scarlet Speedster, all incarnations of the Flash possess "super-speed". This series features the second Flash, Barry Allen, generally considered the first hero of the Silver Age of comic books. The Barry Allen version of the character was featured in a live action television series in 1990, starring John Wesley Shipp. We have 86 of the 246 issues. Issues # Show all copies or only Very Good Near Mint or better. 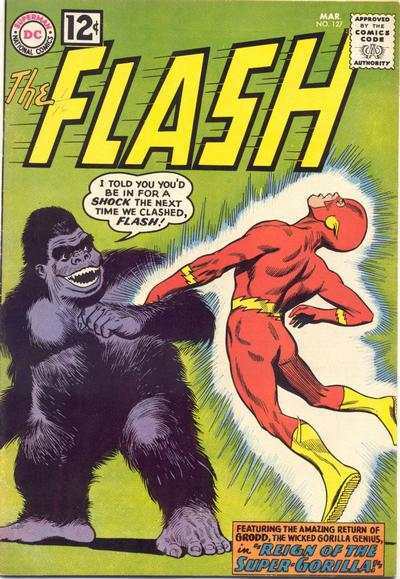 This is the main Silver age series of Flash comics. His debut in Showcase #4 is often pointed to as the beginning of the Silver age of comic book. Click, for a full list of all Flash comics for sale. This version of The Flash was so influential, comic book experts mark the beginning of the Silver Age of comics with his debut in 1956. That's right, without this series, there probably would never have been a Silver Age of comics. Superhero comics were at the bottom of their useful life by 1956. Superman, Batman, Wonder Woman and only a handful of others had survived Congressional hearings into the detrimental effects of some of the more graphic horror comics of the era. Then, in Showcase #4, DC comics re-launched The Flash, one of their heroes from the 1940s. But, instead of just writing stories about the old character, they created a brand new Flash. The 1956 Showcase appearance led to more appearances in Showcase. Even with the success of the Showcase appearances, DC was so unsure of the long-term appeal of superheroes, it took them 3 years, until 1959, to launch this series. This series really is great. Flash's costume is sleek, unlike the original. The artwork is spectacular, by the legendary Carmine Infantino. (In 2006, I went to a comic convention and while the line to talk to Brian Michael Bendis stretched 1,500 feet, you could walk right up to Mr. Infantino and talk to him, which I did, for 1 hour. Crazy. It would be as if you went to a baseball convention and there was no line to talk to Babe Ruth). Infantino is in the Comic Book Hall of fame and the Comic Book Buyer's Guide's 2000 fan poll elected him the best penciller of all time. The success of Flash Comic books directly heralded the return of superheroes. DC dusted off other old heroes, and gave them new origins, new costumes and new stories. Without the Flash's success and DC's revival of the entire superhero category, Marvel would never have experimented with the Fantastic Four or Spider-Man. In short, Flash sparked a revolution. In addition to the great art, the villains are among the most memorable of any superhero. Don't be thrown by the numbering of the series. The first issue is #105 because DC picked up the numbering where the old Flash series ended. If Hollywood ever makes a good movie or TV show based on the Flash, this series would get more attention. As a result, prices are now lower than they should be, making it a collector's dream.... great comics at slightly lower prices (especially when compared to other comics of the era).